See the best and worst fashions on this year's red carpet. After five nominations for the prize during a five-decade-long career, acclaimed filmmaker Martin Scorsese finally received a best director Oscar Sunday night. The auteur won the honor for The Departed, a mob epic that also nabbed the best picture award. Standing onstage to accept the first Oscar of his career, Scorsese received a standing ovation and pretended he couldn't believe it. "Could you double-check the envelope?" Scorsese asked jokingly. After all, the 64-year-old filmmaker had been nominated a total of seven times — twice for screenwriting. "So many people over the years have been wishing this for me — strangers, you know," Scorsese said in his acceptance speech. "I went walking in the street, people say something to me. I go in a doctor's office, I go in — whatever, elevators — people saying, 'You should win one, you should win one.' I go for an X-ray — 'You should win one.'" Apparently, Academy voters also thought it was about time to honor Scorsese, who was previously nominated for Raging Bull, Goodfellas, The Last Temptation of Christ, Gangs of New York and The Aviator. Backstage, Scorsese told reporters what he was thinking when his name was called. "Good thing I didn't get it before. It's a good thing I waited," he said, adding, "Maybe it would have changed the kind of movies I made or something. I couldn't trust myself. I don't know if I was strong enough if I had gotten it before, quite honestly, you know, and I'm glad that it went this way." The Departed won four of the five Oscars for which it was nominated. 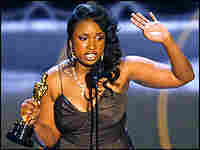 But the most-nominated film, Dreamgirls, only came away with two awards. One of them went to failed American Idol contestant Jennifer Hudson for best supporting actress — for her role as a singer who doesn't get a chance to become a star. In accepting the award, Hudson — who won for her first-ever film role — said the story hit close to home. "I didn't think I was going to win but... wow," Hudson said. "If my grandmother was here to see me now, she was my biggest inspiration for everything, because she was a singer and she had the passion for it. But she never had the chance, and that was the thing that pushed me forward to continue." Dreamgirls had earned three of the five nominations in the best song category. But it lost to Melissa Etheridge and her anthem about global warming — I Need to Wake Up. Backstage, Etheridge told reporters she was a bit surprised by the upset. "Dreamgirls is what music and movies is about," Etheridge said. "It's a musical. It's what I grew up loving," adding, "But that's the way it goes, I guess." Etheridge's song came from the soundtrack for this year's best documentary feature, An Inconvenient Truth, which chronicled former Vice President Al Gore's campaign to save the environment. Onstage, Gore thanked Hollywood for spreading his go-green message. Earlier while onstage with fellow environmental activist and actor Leonardo DiCaprio, Gore played along with the persistent questions about whether he'll make another run for office. "My fellow Americans, I'm going to take this opportunity right here and now, to formally announce my intentions to..." Gore said before the orchestra broke in and he walked off, laughing arm-in-arm with DiCaprio. This year's awards had a decidedly global cast. Winners accepted in a variety of languages: Spanish, Chinese and Italian. And the films dealt with such topics as the human cost of the diamond trade in Africa; World War II from the Japanese perspective; a little girls' reaction to the Spanish Civil War; Queen Elizabeth's reaction to the death of Princess Diana; and four families drawn together by tragedy in Morocco. "When I was a kid, the only way that I saw movies was from the backseat of my family's car at the drive-in. And it wasn't my reality to think I would be acting in movies. So receiving this honor tonight tells me that it's possible. It is possible for a kid from East Texas, raised in South Central L.A., in Carson, who believes in his dreams, commits himself to them with his heart, to touch them and to have them happen." In the best supporting actor category, Alan Arkin upset Eddie Murphy, who took an uncharacteristically serious turn in Dreamgirls. Backstage, Arkin seemed a bit embarrassed for being singled out for the best supporting actor Oscar for his role in Little Miss Sunshine. "I feel in a sense like a hypocrite, because I don't believe in competitions between artists," Arkin said. "I'm happy I have this," he added. "It's very nice. But I don't keep score." He may be the only one.